Scott Easterlow remains frustrated by Racing Club's lack of action. 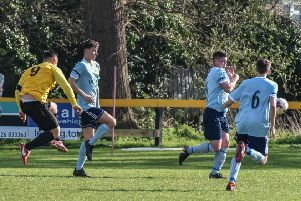 The wet weather continues to hamper Racing Club Warwick’s charge up the Midland League Divison One table, with last Saturday’s trip to Leicester Road and Wednesday evening’s clash at Atherstone both falling victim to waterlogged pitches. It means Scott Easterlow’s side have played just three times since Boxing Day, taking the wind out of their title challenge in the process. With interest in two cup competitions going alongside their bid to overhaul Walsall Wood at the top of the table, it promises to be a hectic end to the season, with Racers already facing an 11-day period at the start of April which will see them play five matches. However, it is not just matches being lost that are the problem as Easterlow explained. “It’s catch 22,” he said. “Everyone knows we have a lot games coming our way at some point but it’s not only managing the games when they come but also managing the training sessions as well. “The predicament we were in this week was that a game on Wednesday night ultimately cancels out training on the Tuesday. However, Easterlow confirmed that his side would be in for training should Saturday’s visit to Coventry Copsewood fall victim to the weather. Racers then face a trip to Tividale on Tuesday night for their Birmingham Midweek Floodlit Cup quarter-final, with the winners set to face Copsewood. Meanwhile, Racing Club have signed central defender Joe Smith from Midland League Division Three side Coventrians.